In terms of sheer age, Daily News marches four solid years ahead of me. But my intimate association with that admirable journal has a history that spans nearly 84 years. This seemingly strange development could be explained fairly simply. As a child, I had an irrepressible urge to read and to imbibe the contents of any, a piece of printed matter, that I could lay my hands-on. At times, it was a segment of an American newspaper that wrapped a purchase from the village grocery. Early on, I acquired the conviction, that reading newspapers will nurture and enrich my wisdom. It may amuse a reader that I had the audacity and the precocity to assume, that I possessed wisdom and it was at an incipient and formative stage at that time. But, that exactly was what happened. I discovered the slew of newspapers that issued from Lake House and was especially enamoured of the Daily News. This was partly because my eldest brother was an avid reader of that publication. He kept faith throughout. The Daily News had an inexplicable appeal to my growing mind, probably because I had an idea that it may add the ‘vitamins’ and the ‘proteins’ that could help the maturing of my wisdom. Its format and the presence held a mysterious fascination for me. In the course of time, I learnt to appreciate some of its features that compelled sustained attention. A popular item in the early issues of Daily News was a strip-cartoon. If I remember right, it had the title ‘Bringing up Father”. He returns home, a wee bit late. Mindful of the wrath of the waiting wife, the man attempts to enter the house surreptitiously. The helpless man is fully unaware that his ever - alert wife is lurking behind the door, armed with a handy rolling-pin, to give the erring husband a fitting reception. The authoritative articles provided a comprehensive intellectual treat to the readers. The Daily News of the time raised a voice that the country’s elite heeded and the lawmakers took careful note of. In stark reality, the Daily News functioned as the conscience of the Nation and was held in due deference by the people. Contributing a letter to the Editor of Daily News would earn for the writer at least a passing prestige from his community. A specific instance comes to my mind. A letter to the Editor written by a local person known to me achieved the presence in the letters column. For quite some time he basked in that ephemeral glory as he suddenly became important in the eyes of his fellow-villagers. Later on, circumstances paved the way for me to be quite closely associated with the Daily News. Way back in 1949 Esmond Wickremesinghe, the Chairman and Managing Director of ANCL personally recruited me to the Editorial Staff of the Institution. I was both physically and spiritually close to the Daily News, as I functioned initially as a member of the Editorial staff of Dinamina. Immediately on my joining the Editorial staff of Dinamina, I received a hand-written personal note from the Editor of Daily News of that day - Jayantha Padmanabha. He was a kinsman of the globally renowned savant Dr Ananda Coomaraswamy. In that intimate note, he requested me to contribute to the Daily News, though I am formally attached to Dinamina. I kept this note preserved until very recent times. It is no longer traceable. As a beginner in professional journalism, this note pleased me no end. My first contribution to the Daily News, after I joined Lake House, was a review of Martin Wickramasinghe's Yuganthaya. This review done at the request of Bonnie Fernando, appeared in the “Book Reviews” column, on March 23, 1949. This was nearly 69 years ago. From then on, I continued to write to the Daily News, somewhat regularly. 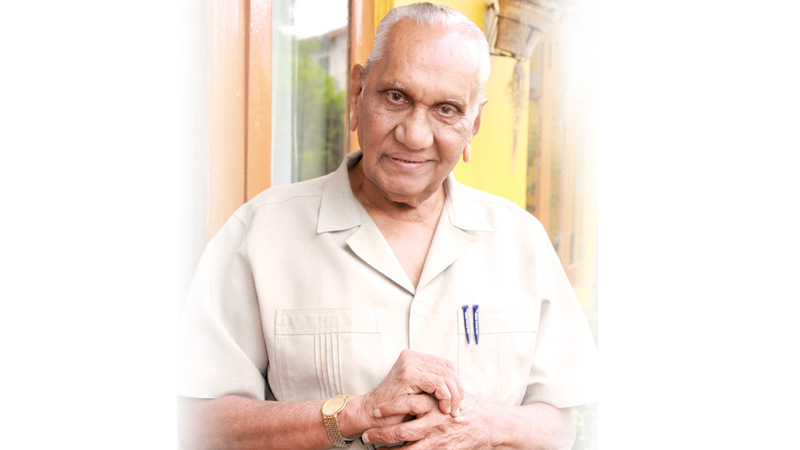 I must recall here that I contributed a series of articles on cinema and related issues, at the request of Philip Cooray – Editor. My brief note on the early days of the Daily News will not be complete, if I did not add my memories of some professionals who adorned the Editorial staff, at that time. The daily routine that was followed by one member of the Editorial staff, intrigued me profoundly. He attends office early, cleans his desk, and carefully places some of his possessions in the locker. It is then that the drama occurs. This Burgher Gentleman picks up the phone and rails and rants non-stop for at least for ten minutes. Then apparently sated, he settles down calmly. I was always puzzled by this daily therapeutic ranting of this staffer. Later on, I discovered that the helpless individual at the other end was a staffer of Reuters Colombo Office. This gentleman supervised foreign news and was seated next to the teleprinter. That piece of equipment at that time created a terrific din. Perhaps, this gentleman ranted against that machine, I thought. Over the past century, the Daily News has maintained an even tenor. At times I am asked a strange question. The interrogator is keen to know, whether I entertain a nostalgia for the past and lament some current trends. This kind of question perhaps stems from the assumption that old people tend to dislike the present and are nostalgically settled on what happened in the ages that are gone. I assure such questioners that I really admire the contemporary version of Daily News. To my mind, the present personality of the Daily News, is the outcome of a logical seamless evolution of the past, through a series of stages. I fully appreciate the typographic personality and the impressive graphic presence of today’s Daily News. I keenly esteem the concessions made to accommodate the sentiments of the millennial, brought up on a staple pabulum of Social Media, and Smart Phones, that link you to vast distances, immediately you swipe the ‘phone’s face. But I am troubled by only one hesitation and misgiving. In several decades will the urge to go online affect the Daily News too? I am sure the Daily News will survive even such eventualities. May the Daily News flourish, defying any challenge irreversible time may pose.